Avian flu hits the U.S. – Only Singapore dares report! SINGAPORE has suspended poultry imports from the state of Kentucky in the United States after a case of avian flu was reported on a farm there. It appears that only Singapore dares report the presence of avian flu in the United States. In these tough times, the United States wants to export – anything, no matter what. In a U.S. supermarket, you could unknowingly purchase and infected chicken. The suspension, which went into effect on April 8, covers live birds, poultry and poultry products, said Singapore’s Agri-Food and Veterinary Authority (AVA). 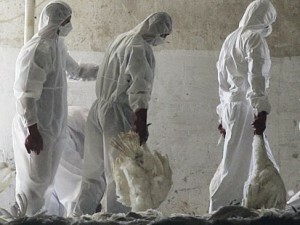 Avian flu is potentially fatal to humans. People who become infected with avian flu can become seriously ill and may die. The symptoms can resemble those of human influenza, including fever, cough, aching muscles and a sore throat. The human health effects of avian flu can also include eye infections and serious respiratory infections, including pneumonia. There is no vaccine against avian flu, and no known cure. Cases of avian flu must be reported to the World Animal Health Organisation as they could develop into highly pathogenic avian influenza viruses and cause serious outbreaks. Kentucky’s contribution to Singapore’s poultry imports is not insignificant: In the 16 months before the suspension, 348.2 tons of frozen poultry from the Kentucky were exported to Singapore. Singapore said it will continue to monitor the situation closely and take additional measures if other US states are hit by the outbreak. 1 comment to Avian flu hits the U.S. – Only Singapore dares report! I don’t like all this stuff related to avian flu. It is very strange that we can’t find any real cure from it. I have read that symptoms of this flu are almost the same as bronchitis or other similar diseases. So if you have sore throat, runny nose, or low-grade fever, I strongly recommend you to visit the doctor as soon as possible. Because as you see avian flu is not the game.